The Commonwealth War Cemetery is a melancholic cemetery which is a resting place for the war heroes who dedicated their lives for Sri Lanka during World War II. This Cemetery is named so not because it is maintained by Commonwealth war graves commission. Located beyond the national museum of Kandy and beside the lakeside, the cemetery can be easily reached on foot from Dalida Maligawa. 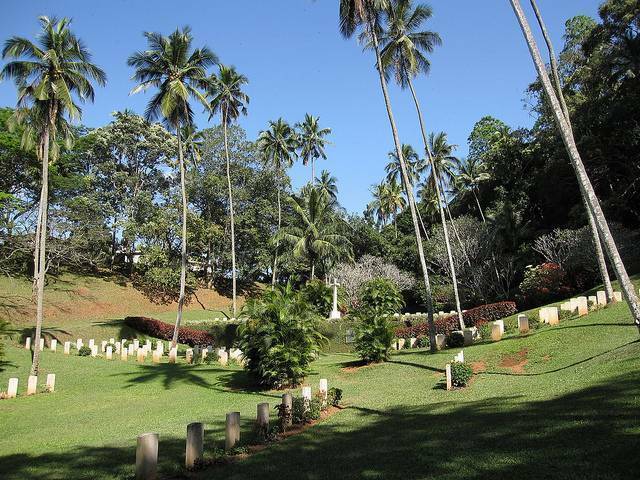 At Kandy War Cemetery you will also find tombs of people who met their deaths in Sri Lanka due to sudden climate changes or diseases. This cemetery was actuated in 1817 when the British retained control of Kandy, but was closed in 1870 due to lack of space. The tombstones and the well maintained graveyards make a peaceful environment rather than give a foreboding feeling. This place provides calmness from the busy environment. Walking among the graves and reading the different information on the tombstones is an altogether atypical experience. It contains graves of young people as well as women, and of people from all backgrounds like doctors, soldiers, lawyers and government servants among others. The Commonwealth War Cemetery is a lovely colonial find. Visit this place and experience the proud feeling for the war soldiers around the world!